Here is the Driveshaft unboxed and on my mechanics tool box ready for install. Here is a photo courtesy of m3tuning is a VAC label J-Fiber non-SMG driveshaft as you can see where it mounts to the flex disc. It has same diameter throughout rather than a taper like the one I am reviewing. With Stan (stash1) and YCW as they worked out the revisions with J-Fiber for the DS. Now they are compatible with SMG due to the taper. Here is a photo at the transmission side and does clear the actuator with no issues. We see no issues for anyone with SMG or 6 Speed manual. Took a quick test drive at 80mph and no vibrations or issues with it yet. 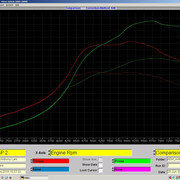 This is with 28psi of boost and on e95 Gave it a few WOT and hasn't blown up yet J-Fiber assured me that this driveshaft is able to handle up to 2000hp. I will update this review as I drive her more and dyno sheet as well. Last edited by WALKD_U; Thu, Jan-10-2019 at 08:04:18 PM. Can we put this on someone else's car that makes a normal/human amount of horsepower for their review instead? Cause how the hell will you know if it makes the engine's job any easier? Looks awesome. Let’s do this! There is 2 other members already have this on their N/A motors. That is Stan (stash1) and Allen (WuBai) both have identical driveshaft that I am currently reviewing. If you think that is not enough you can order the driveshaft at the retail price of $1800 shipped and will be refunded the difference of the GB price once finished. Give us a review like I am doing. Any chance you weighted it? It is 11.483 lbs but I rounded up to 11.5+/- lbs. Update: I asked J-Fiber and they said that average weight for the CF Shafts is about 4.7-5.3kg. Reason of this small variance is due to the counterweight to make the shaft balanced. Last edited by WALKD_U; Thu, Jan-10-2019 at 01:59:49 PM. What’s the benefit of a CF shaft. Less rotational mass? Does it makes a huge difference? All times are GMT. The time now is 10:01:30 PM.